Perfect for kicking back and putting your feet up, this chair and ottoman combination is the ultimate lounge experience. 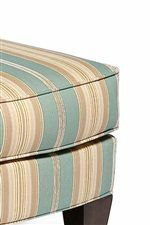 From the chair's high-rising padded back to the ottoman's thick box-faced cushion, this two-piece item will comfortably support your body from head to toe. As if the two items were never meant to be apart, this duo coordinates in both function and style. With both pieces framed by clean lines and tapered wood legs, this duo's casual-contemporary vibe is fit for a variety of occasions and locations within your home. 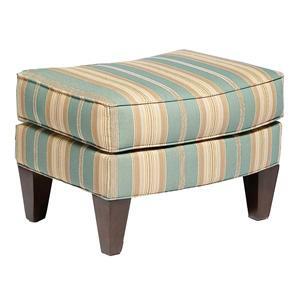 Whether placed in the corner of a room or used to complete a living room ensemble, this chair and ottoman combination will be a functional and fashionable addition to your home. 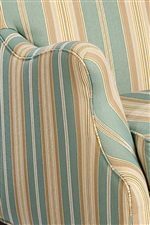 The 5706 Stationary Chair and Ottoman with Tapered Wood Legs by Fairfield at Belfort Furniture in the Washington DC, Northern Virginia, Maryland and Fairfax VA area. Product availability may vary. Contact us for the most current availability on this product. 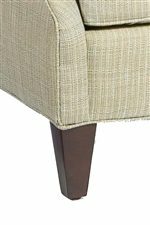 5706-01 Stationary Chair 1 28.5" 36" 35"
5706-20 Ottoman 1 23" 17.5" 16"
The 5706 collection is a great option if you are looking for Contemporary furniture in the Washington DC, Northern Virginia, Maryland and Fairfax VA area. 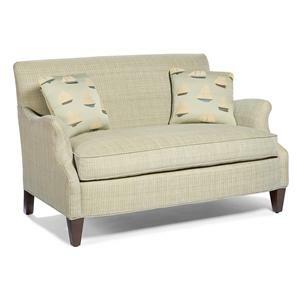 Browse other items in the 5706 collection from Belfort Furniture in the Washington DC, Northern Virginia, Maryland and Fairfax VA area.